Caroline and I waved a final goodbye to La Paz the day after we braved Death Road and survived relatively unharmed. Heaving on my backpack and walking through the city to the terminal is slightly more difficult with my various injuries, but I manage it. We’ve opted for one of the cheapest buses in the terminal and aren’t too surprised therefore at the dilapidated state of the vehicle that pulls in. Entrenched in the ways of our overly-organised nations, we stand a little baffled before boarding, waiting for someone – anyone – to confirm it’s the right bus, look at our tickets, put our rucksacks in the hold or pay any attention to us whatsoever. As the departure time approaches and nothing changes we eventually decide to climb on board, big bags and all, and the bus leaves a few minutes later. We’re the only gringos on board and it’s a hectic, cold and rather disconcerting journey, with frequent stops and interruptions of many kinds. I sleep little, my bag clutched to myself. 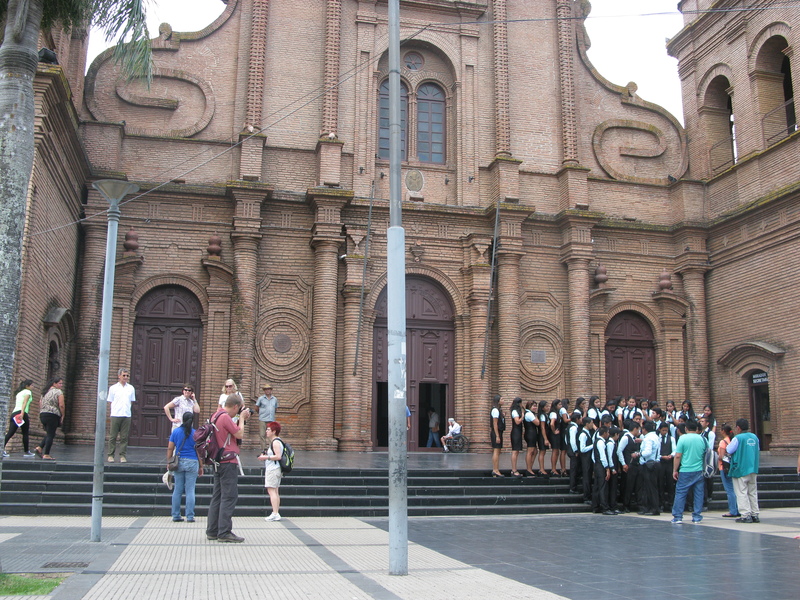 We’re heading to Cochabamba – another Bolivian city around ten hours away – and the first of my detours. My original plan was to head north to the jungle, as Bolivia is by far one of the cheapest places to see the Amazon, but I’ve changed my plan dramatically, because, rather unexpectedly and with very little notice, I’m expecting my third visitor of the trip. He’s flying into Santa Cruz for a two week holiday and I’m saving the best of Bolivia for his time with me. He’s someone I can’t quite call a friend – as I tend to report to other travellers I meet – without my face twitching itself into a mischievous smile. We’d been dating in London before I left, but in my stubbornness to self-exile and feel the full independence of solo travel, I’d more or less broken it off before I left. But throughout the trip we’d continued to talk and slowly I’d begun to see this stubbornness for what it was. Anyway, here he was telling me he’d be flying into Santa Cruz in a week’s time, so I had to start heading east in order to meet him. 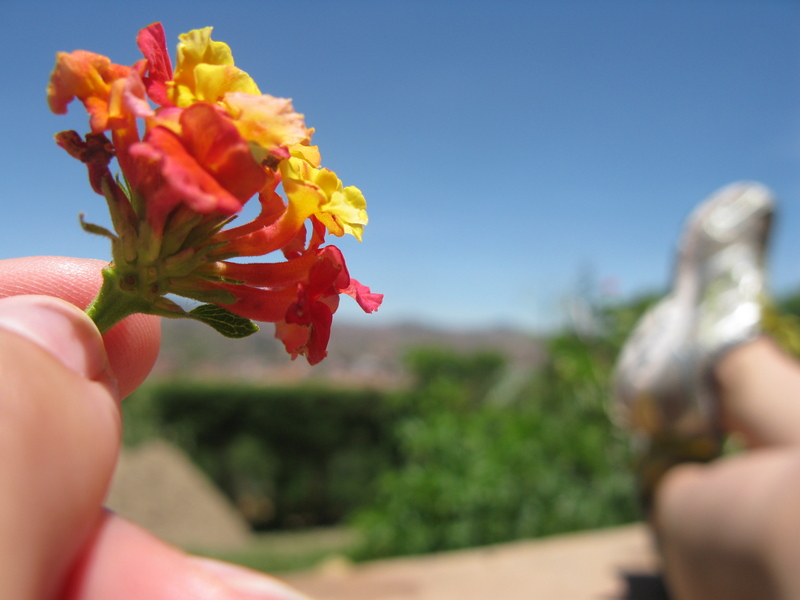 Caroline, on her way to Sucre, decided to break her journey with me for a spell of relaxation on the outskirts of Cochabamba. We spend a beautiful few days together there in a very quiet hostel with large gardens, a projector and a vast film collection. 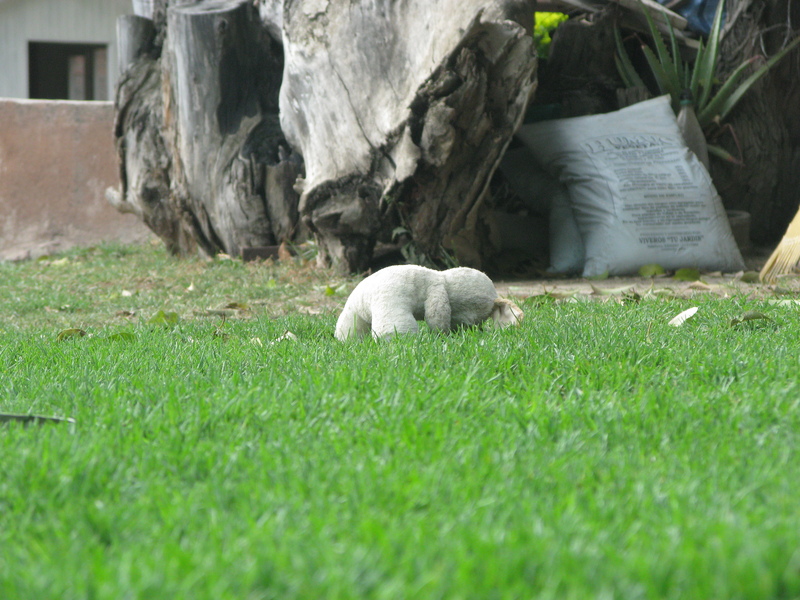 We lie in the sunshine in the grass in the extensive gardens, watching a nearby roof being painted and generally wondering aloud about the mysteries of life and the sad tragedy of an abandoned toy left deserted in the grass nearby. We wonder to the nearby markets, not wanting to venture into the noise of the city itself. We cook extensively, revelling in our large industrial kitchen after so many weeks deprived of one. I get a fair amount of writing done here, allowing myself a break every so often to play Caroline at Yahtzee, to which we’ve both become rather addicted. Even though I’ll see her in a few days when Adam and I pass through Sucre, it’s a wrench to leave her when the time comes. We have some roadside streetfood, a warm apple and quinoa drink – served in a plastic bag and a joint favourite Bolivian delicacy of ours – and play a final game of Yahtzee in parting. Santa Cruz is warm. From the pleasant sunshine of Cochabamba, I’ve moved to a humid and rather oppressive heat which requires the closeness of swimming pools and cool alcoholic drinks at all times. Luckily both of the hostels I stay in have such things available. I lie in the sun and try to concentrate on reading when I’ve settled in, beginning to grow nervous for Adam’s arrival. I also spend one of the days in front of our hostel TV, watching with horror the tragedy of the Paris attacks unfolding. My nerves grow as Sunday darkens. I eat far too much and watch endless hours of Netflix to try and distract myself. But as the hour of his expected arrival nears I find myself walking distractedly about the hostel. Whilst pacing in this way, I’m questioned by other hostel guests, concerned no doubt by my behaviour. But midway through an explanation I hear a taxi pull up and know it’s him. I wait behind the fence and hear his voice in anxious negotiation with the taxi driver, mostly English but punctuated by a few attempts at Spanish words which sound either French or made-up. He’s trying to pay in dollars and I end up having to give him some Bolivian currency of my own. But then the taxi drives off and there he is, sun burnt already from a long layover in Panama, grinning. It’s lovely having Adam with me. We spend those first days enjoying the pool and the sun and each other’s company, him still adjusting to the time difference. We walk once into the centre of town, finding a pretty square and a few bustling markets to lose ourselves in, me daring Adam to try some of the less appetizing street food that’s on offer. It’s a fourteen hour journey getting down to Sucre, and we catch an overnight bus leaving in the early afternoon. It’s a small local bus rather than the larger tourist ones, making our progress quicker and pleasanter for the ability to open the windows and feel the rushing air through the bus. It’s quite an enjoyable journey until it gets dark and Adam suffers the inconvenience of there being no toilet on board, the lack of which sees him standing up for three hours before we make any kind of stop. I feel guilty for sleeping on and off for the greater part of this drama, waking occasionally to offer supportive looks and angry Spanish vocabulary where needed. There’s another man standing up on the bus, and we conclude he must be suffering the same ailment. Hours later, emerging from under my eye mask, we see the buildings of Sucre finally, glittering and white beneath us. Back at some small altitude again, the climate’s perfect – the sun warm but the air fresh and crisp. It puts me in mind of San Cristobal in Mexico with its crystalline blue skies. The nice thing about travelling with someone on a shorter visit is you’re pulled irresistibly into a sort of holiday mindset. Money is more readily spent. You’re taken out of the petty nuisances of dorm rooms and into privates, with double beds and ensuites. And in Bolivia, this has little effect on overall cost, the price of everything so low as it is. To give you an idea, we had a lovely room in Caroline’s hostel in Sucre, complete with an ensuite for just £3.50 each a night. Sucre is wonderful, and I’m annoyed we’re only able to spend a few days here, our schedule tight as it is. We spend much of that first day catching back up on sleep, exploring the food markets and cooking luxurious and overly-large meals. On the second, we walk to the city’s viewpoint and from this vantage see the town laid out sparkling across the horizon amid low hills. It’s lovely and warm, and we find a café there with deckchairs laid out in the sun. I lie reading, having found Hemmingway’s A Farewell to Arms in a lucky book exchange, as Adam wanders away with his camera. I’ve been lying there for just under an hour and have begun to be concerned and a little irritated by Adam’s continued absence, my skin reddening for its long period of exposure. Adam returns and we walk together back into town. His preoccupation with his camera is something I’m going to have to learn to get used to, I begin to realise. The next few days pass happily away spending time with Caroline and her new friends at the hostel. We play walleyball with a group of them – like volleyball but you’re allowed to use the outer walls of the court in the game. Adam and I go to a salsa class together in a cramped little bar – which is fun but rather puzzling due to the many people and cocktails. We lie in the courtyard of the hostel for one full day, getting even more sunburnt and causing general disapproval among its staff and guests, rowdy as we become with our laughter and music choices. And Adam and I spend that evening having a rather long conversation, which results in his officially becoming my boyfriend – which is a lovely if rather unexpected development. Although exultant for our new understanding Adam and I are sad to leave Sucre, Caroline and everyone else there. We say several emotional farewells before getting a bus to Potosi, one of the highest villages in the world, where we’ll spend one night. It’s a surprisingly beautiful town, but the altitude is trying and we walk slowly when we leave the hostel to find a restaurant that night. Adam, less exposed to altitude than I have been, seems to feel it more acutely. 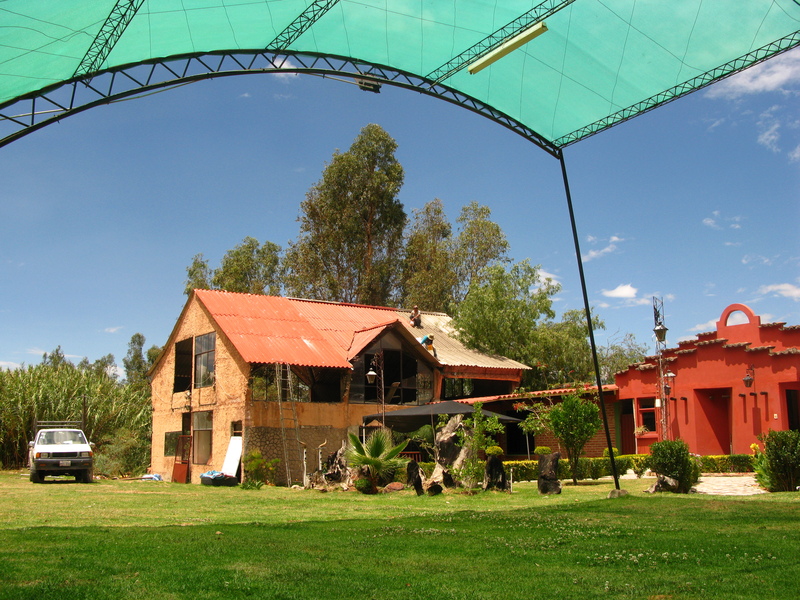 This is a popular stop for travellers in Bolivia as it’s home to a particularly famous mining community and a must-do activity in the village seems to be a visit to one of these mines at work. But as I’m extremely claustrophobic, I have no interest in this, and Adam is equally apathetic. 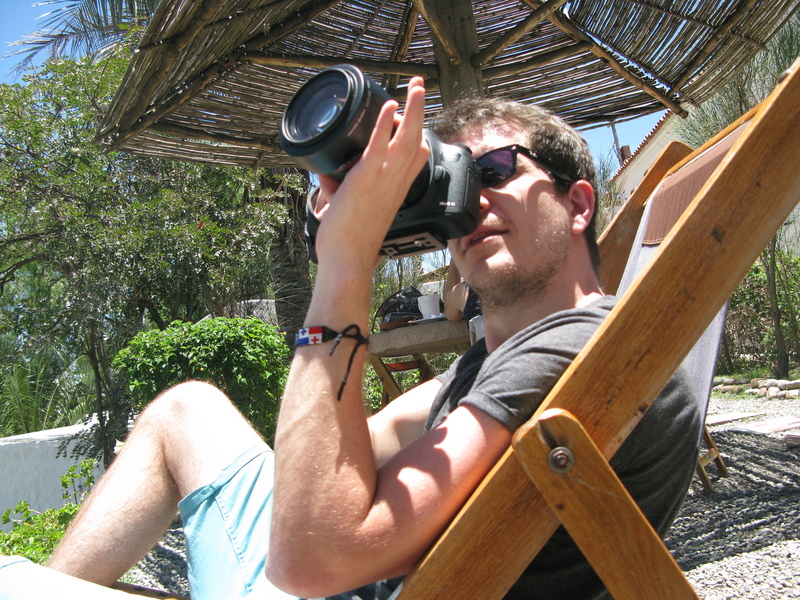 We therefore spend most of our short stay strolling around the streets, finding markets and buildings of interest – Adam naturally armed with his camera. 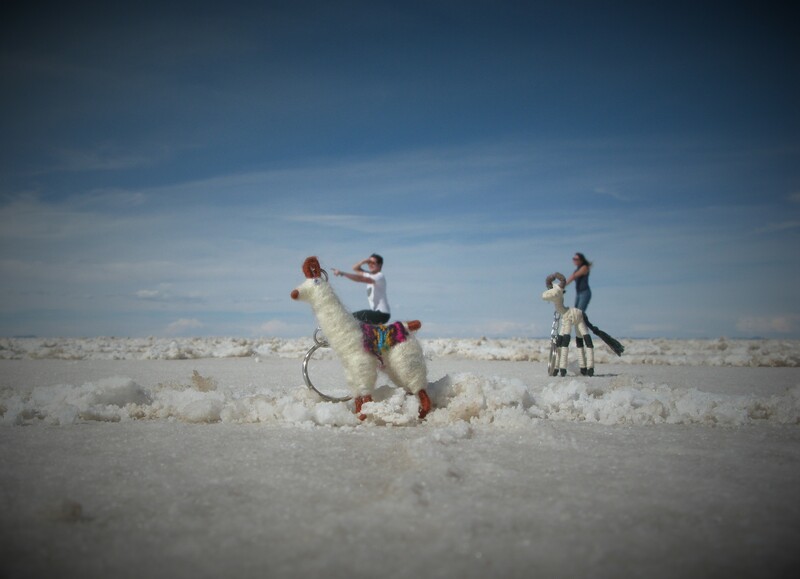 With limited time, we leave the following day, catching a six hour bus for the final section to Uyuni. This is the portal to one of the most beautiful and popular places in Bolivia and one I’ve already heard much about during my time in the country – the salt flats. We sign up to one of the three day tours that night and head off the following morning in a 4×4 with four travelling companions and our driver. The salt flats are incredible. A white desert, squares of salt lines etched into it, stretching miles into the horizon. This is where creative photographers come into their element. The barren landscape lends itself to the invention of fantasy photograph scenarios where you can play around with perspective. Adam and I take this very seriously and have bought a number of props – including dice, small toy animals, playing cards – and we even purchased a giant dinosaur from a nearby village for the purpose. I’ve never been on a tour like this. There seems to be a lot of sights squeezed into the three days and most of the time is spent driving across the stunning landscapes between them. Adam and I sit enthralled in the front seat for these peaceful periods of driving, a tight fit but definitely the best view. We work our way between the salt flats, islands of cacti, caves. The driver takes us through the facts of the places in Spanish and I translate for Adam whilst our American companion translates for his friend in the back seat – which creates a rather amusing, echoing effect. We spend that first night in a hotel made entirely of salt and play Yahtzee with a small Bolivian boy we meet there. I’m quite impressed I manage to explain most of the rules to him in Spanish. Day two somehow manages to be even more stunning. We drive between several lakes where flocks of flamingos graze in the water. It’s a transfixing scene, with the blue of the water and the pink of the birds. We take a huge amount of photographs. We also visit boulder fields, which of course gets me climbing, and one rock in particular of an impossible shape giving it the name the stone tree. We also visit geysers and finally a hot pool where we swim in the early morning of that last day. It’s a challenge to undress before slipping into the smoking pool. The air is freezing outside the water. It’s a long drive back on that last day as we retrace our progress all the way back to Uyuni. If Adam wasn’t there I’d be heading into Chile at this point, as the tour ends at the border, but as it is I’m making another detour to get him safely back for his return flight. 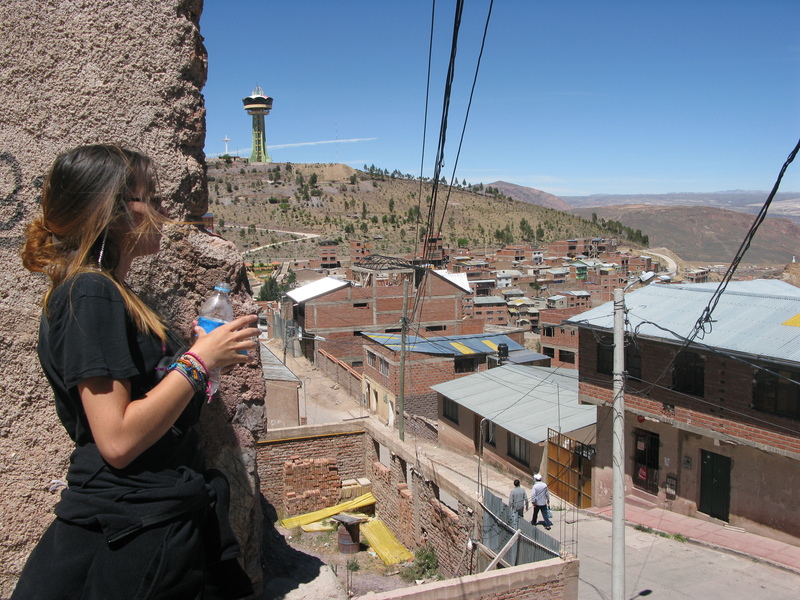 We plan to stay a few nights in La Paz – where I didn’t think I’d be returning – before parting ways. Those days are spent mourning our soon to be long separation, with some exploration of the city and my Christmas shopping, which I’m sending back on Adam’s flight for my family. I feel terrible after this as I realise he has no more space in his bag for any of his own souvenirs or gifts. We say goodbye in the bus station at 5.30 in the morning as I catch my bus across to the Chilean coast and Adam heads to the airport. It’s a sad goodbye, but I console myself that three months is not too long a period of time, and we seem to have survived four already. I head out of Bolivia – a place for which I had very few favourable expectations – with many incredible memories, particularly for those last two wonderful weeks.